Bond: link this card with a friendly creature. 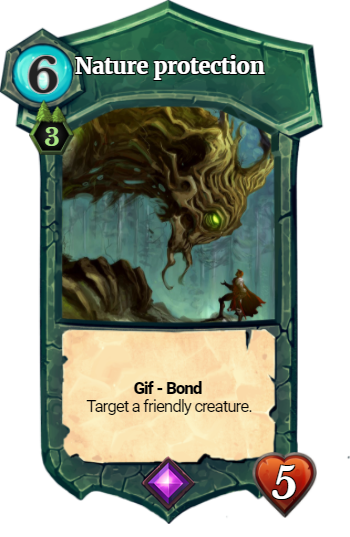 This card take damage instead of the bonded creature. Some ideas for the contest. These are all decent designs. I don’t think any of them are come-back cards though. These are all just as good if not better when you are ahead as when you are behind. Or am I missing something? 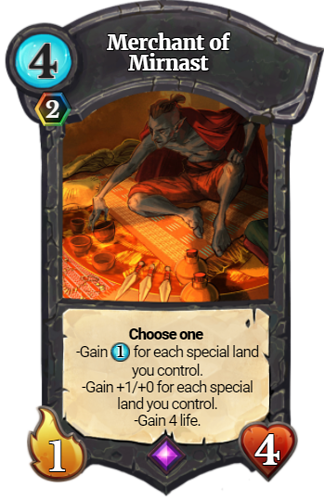 I thought the merchant like a card that you can play either if you are behind or if you have board control, if you lost the board and you have at least 4 special lands you can play it for free as a gatherer and play another creature. If you are ahead you can use itt more agressive choosing +1/+0 for every special land. And the healing is another option to avoid lethal in certain situations. Here is the thing. The objective is to design come back cards. In order for a card to be a come back card, it needs to get you a lot of value when you are behind. 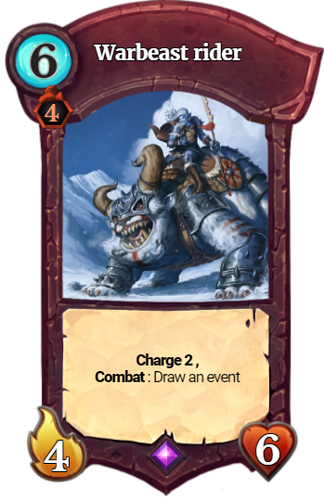 in order for these cards to be balanced, they need to have a considerable drawback, usually being bad/worse when you aren’t behind. Designing a card that is just always good isn’t a come back card. Your Merchant of Mirnast is just a light build around which goes into any deck that makes more than 6 lands. It’s not a come back card, it’s just a OP. 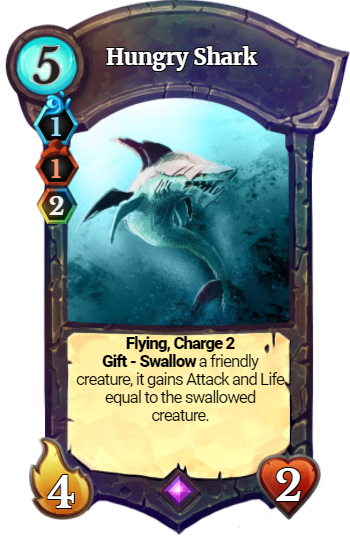 Seriously, consider how absurd this card is in the GB whale decks that are on ladder at the moment. Its a 4 mana 1/4 with gift gain 8F. That’s busted by itself. With FTF, its 5f - gain 12F. It’s just an absurdly strong card. It isn’t a come back card though.